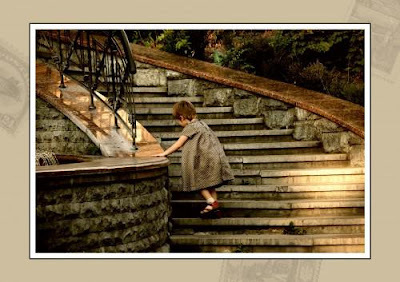 This lovely picture of a little girl negotiating a curving staircase has long been in my list of favourites, and fortunately for me, someone noticed and sent it to me from Lithuania. What a delightful postcard! I had never seen it before. Thank you so much for sharing. I hope you have a delightful and lovely day today. Happy PFF! She'd better not go too fast or she might get dizzy. Oh this card is sooo nice! It reminds me so much of my little brothers whom I took care of when they're around 2-5 years old. They learned to climb and go down the stairs backwards like this. Those stairs look a daunting task for one so small! That is a lovely card, i can understand why you wanted it. my daughter was 9 months when we moved to a new house with a full flight of stairs. We were discussing the fact that we were safe as she could only climb one step. a minute later we looked at her and she was at the top of the steps. ooops. 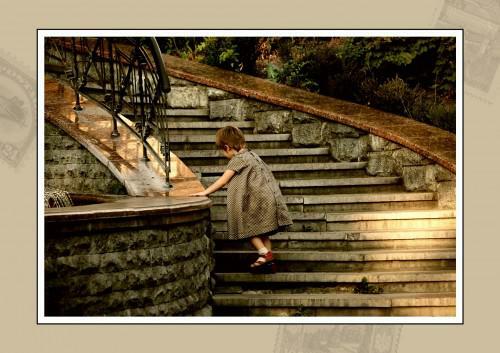 I remember having to hold on to the steps when I was small. LOL! A beautiful card. Interesting how her little red shoes are the bright spots. I like how her dress matches the colors and patterns in the stones and steps. This postcard is so cute and lovely. Beautiful postcard and quite a climb. I would have trouble doing it at my age. I head back to India June 1 for six months though it will be hard leaving my sweet new granddaughter who arrived April 14th ( my first grandchild ). Thank heavens for Skype.